In the dead of winter when many of us dread the very idea of stepping toe outside, I'm excited to have the opportunity to review and offer a giveaway from my favorite juice company, Zola that will brighten and boost a gloomy day! Their juices are based on the Brazilian açaí (ah-sigh-ee) superfruit, boasting 500% more antioxidants than blueberries and 60% more than pomegranates, and include additional Brazilian fruits such as acerola, caja fruit, cupuacu, graviola, and guarana as well as various other flavors. Not only do they have a juice line, but they have nutritionally sound and tasty smoothies and a variety of other acai-based products. I'm going to give a run down on the flavors and mention those of note I liked, then I'll talk more about the giveaway. You can jump down to the giveaway info because this a rather long review, but please take the time to read this post! First, though, I want to mention Project Zola, the program started to support the local community in Brazil where Zola harvests their fruit. 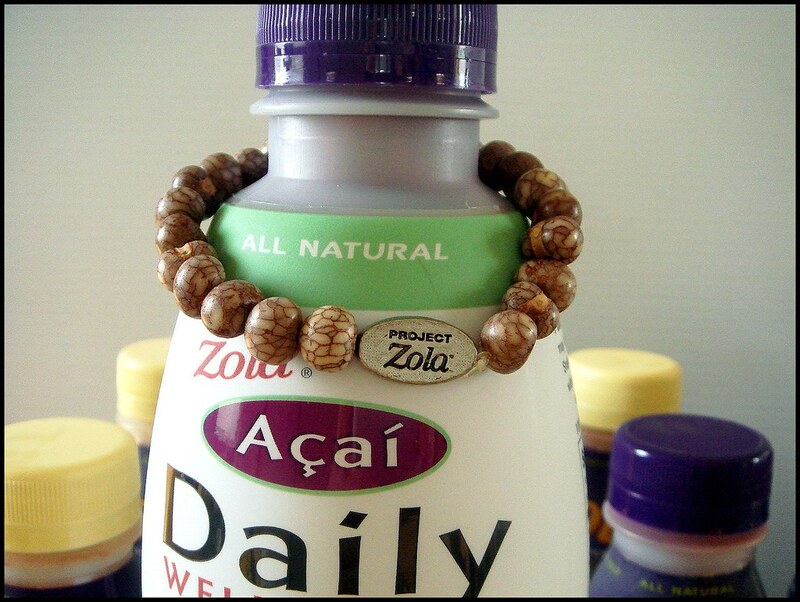 Members of the community hand-make Project Zola bracelets out of the dried açaí seeds. The bracelets are then sold, and Zola gives back $1 from each bracelet directly to the local school they're supporting, Escola Açaímu. The funds pay for teachers, books, and meals for all the children who attend the school. Zola is doing what so many people talk about and tell others to do -- giving back. I appreciate that Zola saw they had the opportunity to make a legitimate difference in the community where their product is based and help out those who might not otherwise receive help. Another great reason to drink Zola! I encourage you to click the link to read up about all they do. This is where it all began. Filled with antioxidants and omega fatty acids, the Açaí berry is turned into a delicious beverage that will leave you refreshed, healthy, and ready to tackle on the day. I kind of thought this juice tasted a bit like blueberry, but not quite. I liked the consistency and the fact that this didn't leave you parched like some other juices can. 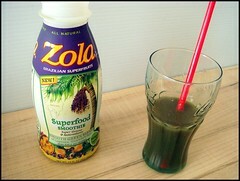 Zola Juices also contain organic guarana, a natural source of caffeine. Guarana contains fat-soluble oils which are released slowly for a prolonged energy boost instead of a spike and crash effect. While most caffeine addicts probably won't see much if any effect from the 24 mg of caffeine in a bottle of Zola Juice, it's a good and healthy alternative for anyone wanting a pick-me-up with plenty of other benefits instead of an energy drink. There was a notable blueberry taste once I drank some of the acai with blueberry juice, so that set the difference apart right there. I haven't been much into berry flavors lately, though this certainly was tasty. My favorite of the juices! I loved the refreshing taste of the pineapple juice, but what I loved the most is how they found the right mix of each so the pineapple didn't overwhelm the acai and vice versa. The flavor was also smooth. 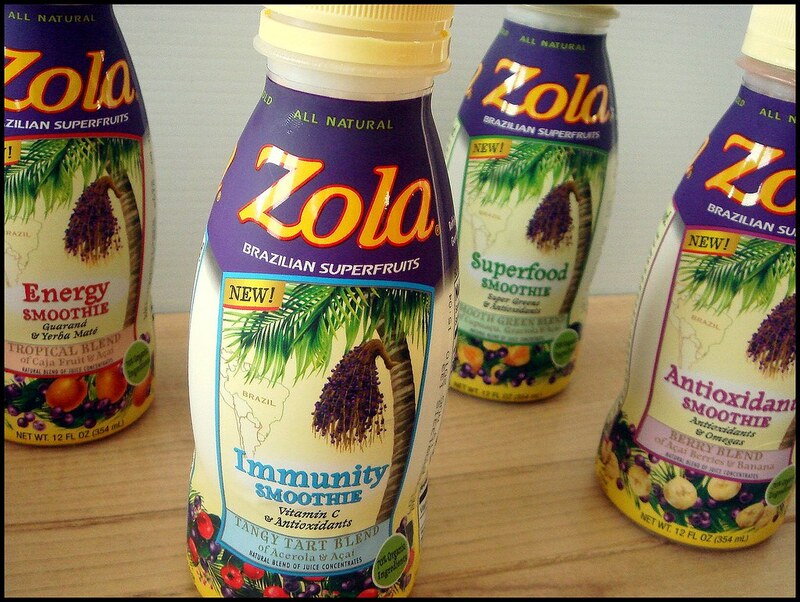 I'm most excited about Zola's light juice, sweetened with a reduced amount of organic evaporated cane juice and boosted by stevia, a natural sugar substitute. 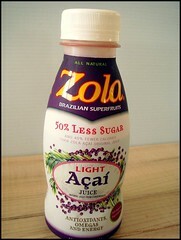 If you're watching calories, this is the juice to choose, with only 70 calories and 11 grams total sugar per serving. There is a slight stevia aftertaste, but not enough to keep a person from drinking it. Since Zola makes claims to be as natural a product as possible, it's nice to see they choose an actual natural sugar substitute. With a Brazilian Fruit Blend of acerola and acai, a bottle of the Immunity Smoothie contains 415% of daily value of vitamin C from the fruits acerola and camu camu. You also receive a boost of citrus bioflavanoids and beta carotene that will naturally boost your immune system and providing extra support during cold season. I and my two testers felt the taste offered a complex tropical flavor that was more on the richer side than light. Very delicious. 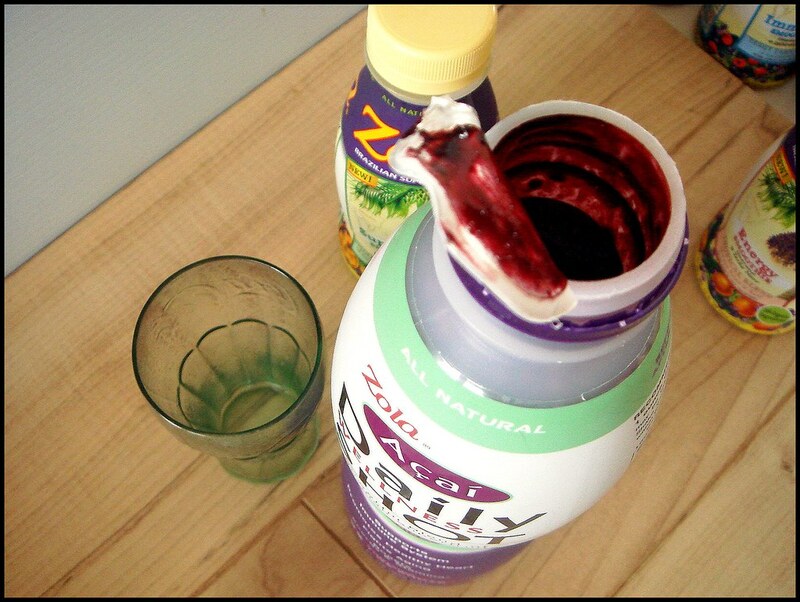 Another note we had about Zola Smoothies was that while the texture was a bit thicker than the juice, it still wasn't as thick as many bottled smoothies and doesn't weigh as heavy on the stomach. The Energy Smoothie, a vitamin C-enhanced natural energy smoothie with a trio of yerba mate, guarana, and green tea that won't leave you crashing. Yes, I do drink my fair share of caffeine, and I'll note that if your tolerance to caffeine is quite high, you might not notice a remarkable difference when you drink this as it only contains 80 mg of caffeine (by the time many people read this, I'm willing to bet you've had triple that amount!). This will be perfect when I want a energy packed treat during the summer when I try to decrease my coffee intake, subbing it out for water. Green drinks are all the rage lately, and Zola gives you the option of being green with their Smooth Green Blend of cupuacu, which has been called "the pharmacy of the Amazon" for its use as a treatment in many ways. The 1500 mg green boost contains spirulina, chlorella, barley grass, spinach, broccoli, and ginger. As with every smoothie but the Energy Smoothie, this does not contain any caffeine. The flavor was mildly grassy, yet not at all disgusting. The fruit juices contrast against the greenery to produce a balancing act that I find quite palatable. If you're new to introducing green drinks into your diet and you want a quick fix, I would definitely recommend trying this out. The Antioxidant Smoothie's flavor has a berry blend of acai berries and bananas. As I said way up there, acai has more free-radical fighting antioxidants than any other fruit, and coupled with acerola, which is one of the richest known natural sources of vitamin C, you've got all bases covered. Each bottle contains 125mg polyphenol antioxidants, providing insurance against a not-so-balanced diet, perhaps, or a boost to an already sound diet. Simply as a delicious drink, this delivers. So maybe you're remarking how it doesn't much matter if you drink a bottle of acai juice because one day of consuming a rich source of antioxidants isn't going to do much in the long run. I agree. It's a balancing act -- the more consistently you eat healthy foods, the more you reap the benefits. It's not an occasional thing at all. 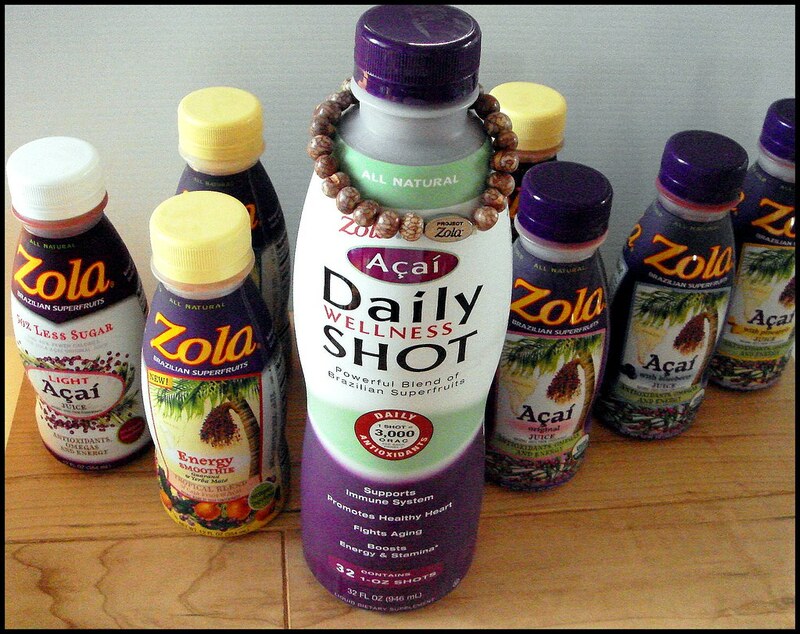 That's where Zola's Acai Daily Wellness Shot comes into play. Each 1-ounce shot of delivers a full dose of antioxidants, which help protect your body from free radicals, supporting your immune system, promotes a healthy heart, as well as providing anti-aging properties and boosting your energy and stamina. Each shot also contains 3,000 ORAC units, which also help fight free radicals. 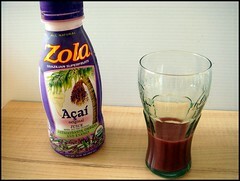 Read more about the benefits of antioxidants on Zola's website. It's been about 5 days into taking the wellness shot, and I'll be posting after I've been taking it for 30 days on any difference I've felt it's made. 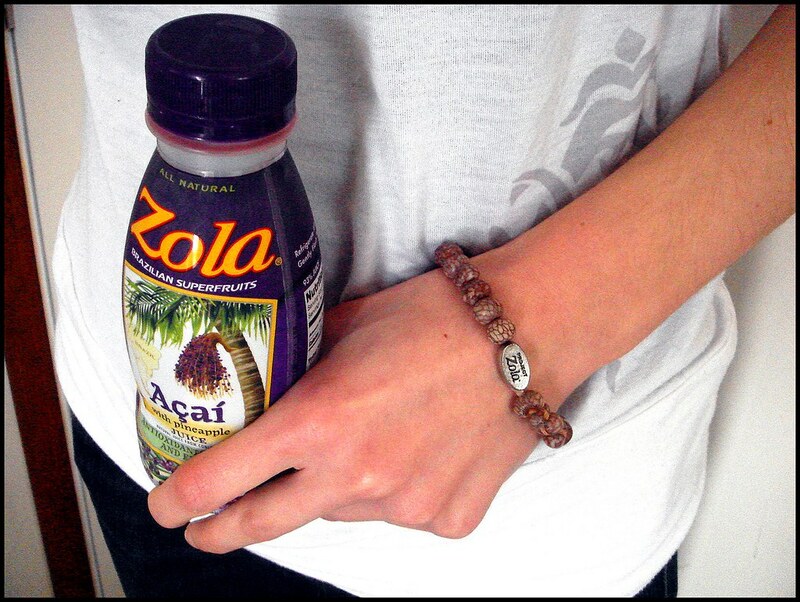 Congrats to Emily from Sugar Plum, who won the Zola Prize Pack! P.S. None of these statements are evaluated by the Food and Drug Administration because, well, why would they want to. In full disclosure, I've received these products from Zola for the sole purpose of giving you my honest review on the products, so besides restating stats found on their site and their info packet, all opinions are entirely my own and I challenge anyone to suggest otherwise. Do you own stock in this company or something? On a serious note, are these juices useful for things like marinading or in stir-frying? I always find your disclaimers amusing! I would love to try their products! They sound right up my alley.